(TibetanReview.net, Mar14, 2015) – More than 8,000 people attended religious teachings and empowerment given by the Dalai Lama over Mar 11-12 at the Palpung Sherabling Monastery at Bir, Near Dharamshala, of Tai Situpa Rinpoche who made a Long-Life Offering to the exiled spiritual leader of Tibet. The Tai Situpa is one of the top spiritual masters in the Kagyu tradition of Tibetan Buddhism. 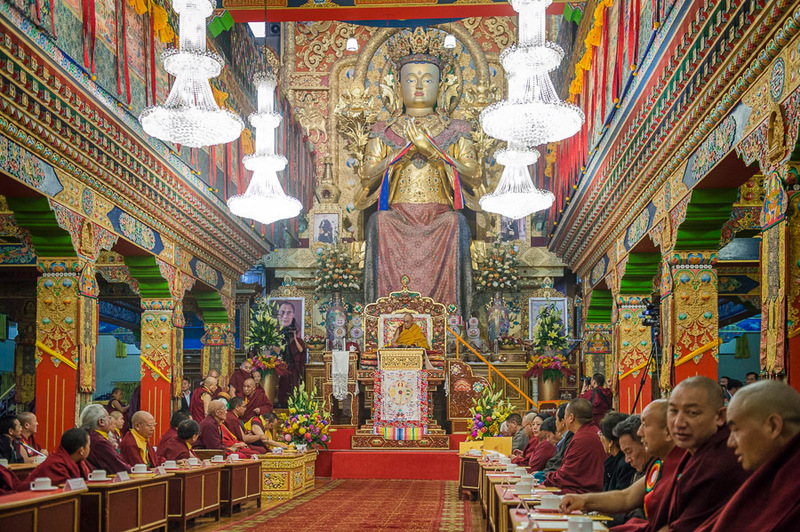 The Dalai Lama also cut the ribbon to inaugurate the newly constructed Lungrik Jamphelling Institute, the new learning centre of the monastery. He recited consecrating verses before the statues of Marpa Lotsawa, Manjushri, Buddha Shakyamuni, Guru Rinpoche and Situ Panchen, Chökyi Jungney in the centre’s hall. He also visited the nuns’ retreat centre and then the Naro Meditation Centre, where monks were on retreat. At both the centres he recited brief consecration prayers. The Dalai Lama also gave a short teaching on Atisha’s ‘Lamp for the Path to Enlightenment’. He was seen off by Tai Situ Rinpoche, Jamgon Kongtrul Rinpoche and a large crowd of Tibetans and people from different Himalayan regions.